Some crimes are too heinous to go unpunished. Morgan Clancy seeks the man responsible for the deaths of a great number of men, including his younger brother. 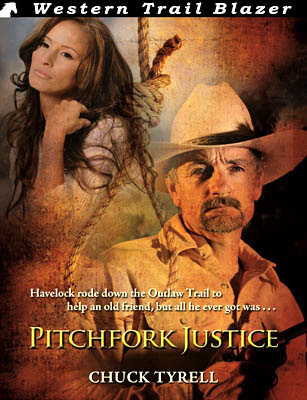 When the trail leads him to Bluestone Creek, Colorado, his search for justice becomes entwined with the plight of several farmers and one local rancher. Clancy’s battle escalates when his meddling uncovers a theft of cattle and endangers the lives of a young woman, her sister and father. The stakes are lethal and when the final battle comes, Clancy discovers his trail of vengeance may cost all four of them their lives…. 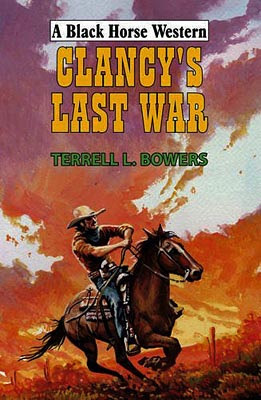 Terrell L. Bowers combines the bringing to justice of war criminals with the more traditional storyline of a land grab. The war crimes were committed in Andersonville where prisoners were robbed and killed at will. With only the camp commander Henry Wirz looking set to pay Clancy’s sets out to bring to justice other prison guards who were responsible for his brother’s death and many others. Terrell L. Bowers also includes a young woman who has Downs Syndrome, something that is rarely seen in a western. Her child-like innocence leading to some touching moments, and she will have an important part to play in the final showdown between Clancy and those he hunts. The book is written in an easy to read style and moves forward at great pace. Characters and landscapes are well described as are the many action sequences. As the story heads towards what seems like a predictable end Terrell L. Bowers springs a superb surprise to the identity of one of the characters giving the story a neat twist-in-the-tail. As with the other books I’ve read by this author I’m left looking forward to his next. With the promise of $10,000 still ringing in his ears, professional fighting man Carter O’Brien rode south to free Aaron Norris, a big-shot politician who’d been framed for murder. But it wasn’t going to be easy. Norris was being held in a prison nearly two hundred miles from home, and it was a veritable fortress that had been built right on the doorstep of a garrison full of Mexican soldiers. As if that wasn’t bad enough, there were others who’d set their sights on the reward — two get-rich-quick Americans named Pope and Trace, and a half-Cheyenne Dog Soldier called Sundown. This story is one of fourteen starring Ben Bridges’ series character Carter O’Brien. It doesn’t matter if you haven’t read any of the others before this as it is a self-contained novel. It was originally published by Hale as a Black Horse Western back in 1988. Like other books by Ben Bridges I have read this one is told at an ever increasing pace and is filled with well-drawn characters. Captain Vadala, the man in charge of the prison, being one of particular note. Diane Norris is another, a woman who will play an important role in O’Brien’s plan to free her husband. O’Brien’s plan actually sickens him but he can see no other way and it makes for some very tense scenes, especially when trying to escape the prison with Norris. Ben Bridges is a pseudonym used by David Whitehead, and he’s an author that I find a pleasure to read. Once I’ve read one of his books I immediately find myself wanting to read another. The Ben Bridges ebooks are very affordable and there are many to choose from (with more to come) so if you’ve never tried his work maybe now is the time to see what you’ve been missing. Jake Worthy was not born to be a gunman. His sole shooting offence was firing back at a crooked gambler in a Tucson saloon. For that he received a six-month sentence in the notorious Yuma prison. He meant to serve out his time patiently until he could return to Rio Lobo and Becky Holland, the girl who waited for him there. Bushwhacked along the trail home, he was taken in by a gang of thieves who wanted him for his gun. Led by a beautiful, money-crazed woman named Yvonne and a cold-eyed killer, Bill Davenport, they meant to pull a big freight office job, but were short of gun hands. It was join up with the gang or be left in the mountains to die. Urged on by Yvonne, Jake was led along a trail of treachery, violence and murder which destroyed his chances of finding a peaceful life. This book is filled with a terrific set of characters, not least the hero Jake Worthy who sees his dreams being destroyed by events out of his control. Even when he seems to have come up with a way to get his life back on track Logan Winters springs one hell of a surprise that sends Worthy’s hopes spiralling downwards again. Many BHW have a strong woman as part of the cast and so does this one, but Logan Winters adds to that by having three great female characters, all of whom will play decisive roles in the future of Worthy. This fast moving, action packed book proved to be unpredictable in the direction the story would take, who would die, who was planning what double-cross and whether Worthy would rekindle his romance with Becky or start an new one with either of the other main female characters….if indeed he would find happiness with any of them. I’ve long been a fan of Logan Winters (a pseudonym used by Paul Lederer) books and would put this one right up there with the best of his Hale westerns. When Tom Nation was lynched for no good reason there was only Ed Colerich left alive to take word back to the T Bar N on the Brightwater. So when six rode to Texas, they only had two things on their minds: an eye for an eye and a tooth for a tooth. With guns blazing and blood flowing there wasn’t one man or woman among them certain to return to the T Bar N alive…. With over 30 Black Horse Westerns to his name this book certainly shows why Elliot Long is so popular with readers. With a well thought out storyline, that is never predictable, and strong, engaging, characters of both sexes the book grips from the opening lines. The first part of the story fills the reader in with the backgrounds of the Nation family and friends as the menfolk return home from the Civil War to discover their ranch in ruins and set about rebuilding. When Tom Nation is lynched by a bunch of ex-Confederates the tale really picks up in the action stakes and gunplay fills the second half of the story. There’s one of two surprises in store regarding the real identity of a couple of characters as the tale moves swiftly through some savage gunfights, ambush, murder and kidnap in the quest for revenge – and it’s not just the Nation’s looking for vengeance. 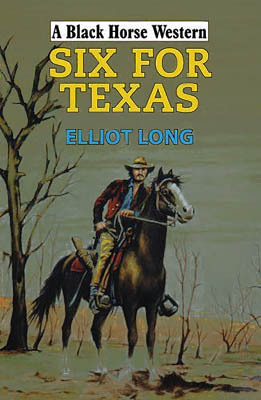 Six for Texas proved to be a very entertaining book and left me eager to read more of Eliiot Long’s work. Six for Texas has an official release date of January 31st but is available now from the usual Internet booksellers. Here's the fifth part of the list of western series and sequels that I have, or have had, in my collection. You can find the previous parts by clicking the title in tags at the end of this post. 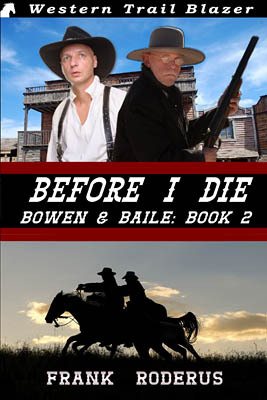 Sheriff Ben Stillman knows that every lawman could face sudden death. But that doesn’t ease his anger over Marshal Boomhauer’s brutal murder. And old Charlie’s shoes have already been filled by his brash, young deputy – who isn’t exactly out shaking the bushes to find the killers. The new marshal is blaming the murder on a band of gypsies who moved north – or was it south? It’s becoming clear that the town of Lone Pine has something to hide – and that Stillman is outside his jurisdiction. But the lawman’s code says that you take care of your own. So Ben isn’t going home until he’s served up some justice – whether it’s by the rules or not. 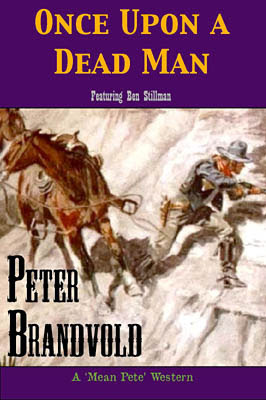 In this, the sixth Sheriff Stillman novel, Peter Brandvold takes his hero away from his hometown and his wife and drops him into the middle of a mysterious killing that no-one wants Stillman to solve, which, of course, makes Stillman all the more determined to do so. But this isn’t the only problem Stillman has to struggle with, there’s Nell, a woman who’s attractiveness is tempting – could Stillman succumb and be unfaithful to his wife? 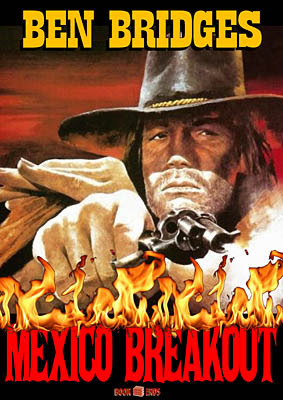 The story is packed with action, including murder, gunfights, ambush, and being trapped in a cave. Then there’s the secrets, the reason Marshal Boomhauer was killed, that lead to a shocking answer, that, when discovered by Stillman only makes him want to see justice done all the more. Once Upon a Dead Man proved to be a gripping read, so much so that I read it in one sitting, and found myself reaching for the next Stillman book immediately. 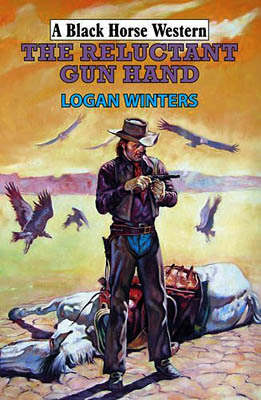 This is definitely a book not to be missed by any fan of the western genre. The first official job for the Bowen & Baile Detective Agency seemed straightforward – find a missing wife and bring her home before her husband succumbs to cancer. But nothing is ever as easy as it sounds. Searching for the ‘lady’ in question takes the partners from fine hotels to the seedier side of several Colorado towns. Will they accomplish their goal in time? The first case for Bowen and Baile sees the younger man learning the ropes from the elder Bowen and this leads to some lively, and often humorous, dialogue between the two such as their views on stagecoach verses rail travel. There are some great characters to be found within this story and some well written action sequences, such as the excellent barroom brawl and the final shootout as Bowen & Baile race for a train. Like the first book in the series this one proves to be a fast moving and very entertaining read that has left me hoping it won’t be too long before the third story appears. Ness Havelock rode the Outlaw Trail, partly because he was a loner and partly because he was running away from Rita Pilar. But now an old friend called for help, and Havelock could not refuse. When he got to Saint Johns, the Pitchfork Outfit was getting ready to take over the town, the county, and the state – if Judge Harlow Wilson got his way. Wilson courted Rita Pilar. He bragged about 50,000 head of cattle on the way up from Texas. He bilked immigrants. And he dealt out his own brand of justice ... with a quirt and a bullwhip. He was unstoppable, until Ness Havelock rode in to Saint Johns. Ruel Gatlin wanted Havelock dead for killing his brothers, never mind it was three against one. He followed Havelock out of Colorado, across the bridge at Mexican Hat, through Canyon de Chelly, and into the high country of the Great Colorado Plateau. Then Harlow Wilson offered to pay for what Gatlin wanted anyway: Kill Ness Havelock. Chuck Tyrell takes an unusual approach to his writing of this novel switching from first person, his hero’s view, and third person for everyone else. He does keep this to a chapter by chapter layout though as mixing both points of view per chapter it would become very confusing for the reader I think. Ness Havelock may be the hero but the most interesting character for me has to be Ruel Gatlin as I found how his view of Havelock changed as he discovered just what drove the man he intended to kill fascinating. Judge Harlow Wilson is definitely a bad guy that needs bringing to justice. He’s a man who has a passion for whipping those unfortunate to displease him, particularly young boys. It’s the death of one of these youngsters that gets Havelock involved in bringing Wilson down. Chuck Tyrell (Charles T. Whipple) also includes a number of real life characters, such as Commodore Perry Owens. Lots of action, great descriptions of the unforgiving countryside including the flora and fauna, there’s also a struggle to accept love, and the time honoured western theme of revenge. This all adds up to a well told tale that’s worth reading. If any of you think this book sounds familiar then you may have read it in its abridged form as it was first published by Hale in their Black Horse Western range as Trail of a Hard Man in 2006. The bounty hunter Lou Prophet wakes up in bed with a soiled dove to find a penciled note deposited in the dove’s cleavage. Bring them the head of Melvin Badthunder! Can Prophet hunt down the savage border bandit in time to save his comely partner’s life? 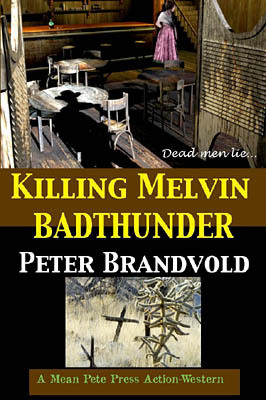 Killing Melvin Badthunder is another excellent addition to the ever-growing collection of short stories from Peter Brandvold and this one features his popular series character Lou Prophet. Gritty, violent, fast moving, this is a tale you won’t want to put down. At first the story seems pretty straightforward but Pete has a few surprises waiting as nothing is as it first seems. I, for one, didn’t see any of these twists coming and found they gave the tale a hard-hitting ending. Definitely another Peter Brandvold short story not to be missed! If you’ve not got around to picking up Pete’s previous short stories you can now get six of them in the just released Western Shorts Vol. 1. 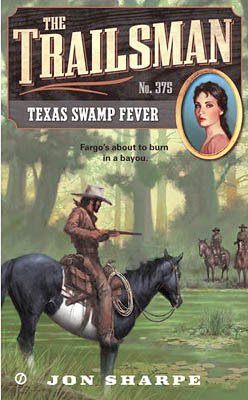 1861, the Texas swamp country – where there are a hundred ways to die. The Archaletta Swamp is the last place Fargo wants to be. The terrain is dirty, dangerous, and deceptive, and the locals are worse. But he agreed to guide a government party on a peace mission to the Kilatku tribe, if they can make it through. Too bad for the Trailsman that the deadliest predators in this swamp walk on two legs…. This entry into the excellent Trailsman series takes Skye Fargo out of his usual stamping grounds and sees him venturing deep into the swamps to face untold terrors. And it’s not just animal life that threatens Fargo and his companions, there’s the Kilatku and the white men who call it home, a couple of whom will cause all kinds of headaches for the Trailsman leaving him at the mercy of nature, this scene providing some extremely tense, and memorable, reading. Descriptions of the swamp and the creatures that inhabit it are superbly written, painting vivid imagery in the minds eye. Packed full of action and frantic battles with the Kilatku, who are one of the more deadly threats The Trailsman has to face and could be equally at home in a horror story with their taste for human flesh…. Brutally savage at times and filled with cracking dialogue this story proved to be very hard to put down which saw me reading it in one sitting. So, once again, Jon Sharpe (in this case David Robbins writing behind the pseudonym) has come up with the goods, strengthening my belief the The Trailsman is one of the best western series being written today.